The infamous former prison island just off the Adriatic coast of Croatia, between the mainland and the island of Rab. Initially set up for political prisoners in the former Yugoslavia, it later also had regular criminal inmates. Prisoners had to perform forced labour in quarries and various workshops and were frequently mistreated in cruel ways. It is hence often referred to as “Tito's Gulag” or “Croatia's Alcatraz”. The prison was closed in the late 1980s and its cell blocks, workshops and administrative buildings have been abandoned since. The island and its ghost town ruins have in the meantime become a visitor attraction of sorts. In the summer season there are regular tourist boats going there. Go off season, though, and you may have the entire island and its ghost towns to yourself. That's what I did and it was definitely the highlight of my trip to Croatia in the spring of 2018. More background info: The Croatian name of the island means literally “naked island” and is probably a reference to the fact that it is so barren (although I also found the claim that it had more to do with nudists – cf. also Rab). In fact it used to be totally barren, devoid of virtually any vegetation, until the prisoners planted the trees you now see in parts of the island. It's not that unusual for islands to be so barren in these parts – several of the neighbouring islands are also as barren as Goli Otok, e.g. the south-eastern side of Rab, or the totally “naked” island of Otok Prvić to the north. The island is about 2 miles (3 km) across from west to east, and a little more from north to south, so not very big, but quite forbidding to look at. Its rugged terrain outside the built-up and wooded parts is covered with parched beige-to-white rocks. It's like a bleached moonscape. The island used to be uninhabited until World War One, when the Austro-Hungarian Empire (to which these parts then belonged) started sending POWs from Russia to the island. But it was abandoned again after the war, when the island fell into Italian possession and was only used for grazing sheep. 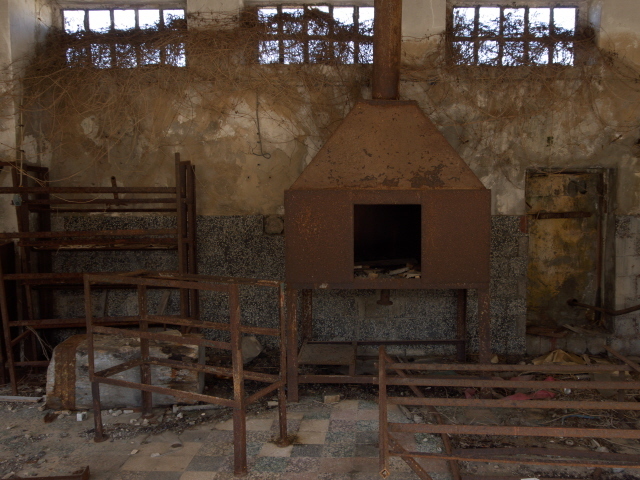 However, it resumed being used as a prison in the post-WWII Yugoslav era under its communist leader Tito. 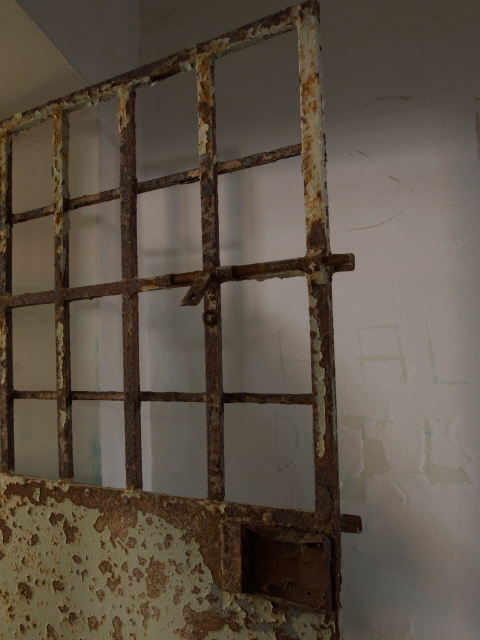 The prison on Goli Otok was first set up in 1949. That was just after Tito had fallen out with Stalin and the Soviet Union and started pursuing a “third way”, within the communist world, but outside the Eastern Bloc (instead he later founded the Non-Aligned Movement – cf. Brioni). So the first prisoners were genuine or merely alleged Stalinists and pro-Soviet communists, but also anti-communists. It's of course not without some grim irony that Tito would suddenly resort to such Stalinist-like methods himself after just having distanced himself from the Red Tsar. The arrests by the secret service, enforced confessions obtained by torture, with ensuing sentences to forced labour and “re-education” in the prison – all of this is quite reminiscent of Stalin's purges in (especially) the 1930s. From the second half of the 1950s onwards, non-political convicts were also sent to Goli Otok's high-security prison. But that didn't mean no more political prisoners at all. Instead the range of offences became even wider, including those accused of being monarchists or social democrats. Some victims' only “crime” was attempting to cross the Yugoslav border illegally. The prisoners had to do forced labour, initially in stone quarries, later also in workshops for metal and woodwork, making tiles and marble floor slabs and assembling furniture. They also constructed many of the buildings on the island themselves. In addition to the tough working conditions, the prisoners were frequently treated badly, including torture (beatings, waterboarding, loading the victim's chest with heavy objects while they were lying down to make breathing nearly impossible, and many other methods of cruel ingenuity). Allegedly one especially degrading treatment was having prisoners stand still in the blazing heat and sunshine in summer to provide shade for the little saplings of the trees the prisoners had planted … so the small plants were deemed to be worth more than a human. That was the message. This was generally also the point of such treatment: so-called “re-education”, which in effect meant dehumanization, breaking the prisoner's will and personality, rather than simply making them physically disappear, i.e. secretly killing them. Yet, quite a few did not survive this “Gulag” in the Adriatic. How many succumbed to the treatment and/or diseases is hard to ascertain. Different sources vary greatly in the figures they venture – roughly between 300 and 4000 (the latter is probably inflated). The total number of prisoners that passed through Goli Otok over the years is given as something between 15,000 and 30,000. One can assume that the regime on the prison island was somewhat less harsh in the latter years of its existence, especially after Tito's death in 1980. Anyway, the prison was closed in 1988, and completely abandoned in 1989. It has since been severely looted, and shepherds from neighbouring Rab have resumed using the island to graze their sheep. All during its use as a prison the island was officially a top secret. Released former inmates were not allowed to talk about it, and so the place was just shrouded in ominous rumours. It was only from late 1970s/early 1980s that written accounts by former prisoners began to be published (one example is “Goli Otok – Hell in the Adriatic” by Josip Zoretić). During the break-up of Yugoslavia and the Balkans wars of the 1990s, little attention was given to Goli Otok. But with the return of tourism, and its dramatic growth over the past decade or so, the former prison island gradually started to appear on visitors' radar too. Though not necessarily in the best way. In the holiday season, i.e. mainly the summer, there are regular boat tours from neighbouring islands such as Krk and in particular Rab, which is just three miles or so away from Goli Otok's little harbour. On the island there's even a typical “tourist train” (the type on wheels not rails, and towed by a small tractor, not a locomotive). This takes so-inclined visitors on a quick circuit of parts of the island. There is a seasonal restaurant and bar by the harbour, as well as a souvenir stall. I've seen videos online that confirm that it can get quite crowded and very touristy indeed in high season. I doubt many of those visitors come with a genuine interest in the grim history of this place, it's probably just “something to do” when holidaying on Rab. So I decided to go off season, and even though the getting there and back is harder to organize (and more expensive), the benefit was that for most of the time there were no other visitors at all (until just before the return crossing – see below) and this was much, much more conducive to savouring the unique ghost-town atmosphere of Goli Otok than having to share it with hordes of lively holidaymakers in flip-flops. By the way, Goli Otok is often touted as “Croatia's Alcatraz” – but the analogy to Alcatraz is perhaps not so fitting as “the Robben Island of Croatia” would have been, since Alcatraz never was a political prison but a high-security penitentiary for non-political prisoners, whereas Robben Island was a political prison island (in South Africa). In fact Goli Otok, having served both functions, is actually in between the two more famous counterparts. What there is to see: Quite a lot, actually, more than the uninitiated might expect, or what the view from neighbouring Rab reveals from a distance. Looking over from Lopar on Rab you can make out a few of the buildings/ruins behind the two harbours and to the north of them, but nothing of the complexes of buildings hidden in valleys further inland or around secluded bays. To explore all that up close you first have to get there, of course. In high season there are regular tourist boat trips, but these a) do not allow sufficient time on the island, and b) the atmosphere on these is not amenable to appreciating the “abandonedness” of the former prison colony. So I recommend hiring a private boat, and heading there at times when the tourist boats do not, preferably off-season when they do not run at all (at least not on a regular basis – but see below). That's what I did, hiring a boat with a skipper in Rab, more precisely from the marina in Lopar, in the north of the island, closest to Goli Otok. It was just a little underpowered barge, a fishing boat with an ancient two-stroke engine, so the crossing took ca. half an hour, but it did the job. On arrival at the harbour of Goli Otok, a three hour time slot was agreed for me and my wife to have on the island, so we rushed off exploring. I had done some homework so I knew where to head and where my priorities lay. This was thanks to a very instructive, if by now somewhat dated, website that provides lots of details, locations and some background info. It's called simply goli-otok(dot)com, but to get access you have to apply for a password by email; the site is primarily in German, though an English version is also on offer, albeit with less than perfect translations, but it'll do for orientation. Some things have changed, however, as I half expected, and indeed I could no longer find some objects and inscriptions reported on that website. But there's still plenty that have survived. At the harbour is also a sign giving a rough overview of the different parts and the routes of the paths on the island. The “train station” for the “Goli Express” was thankfully not in use, the souvenir stalls had not been set up and the restaurant by the quayside was closed and boarded up. So, as our skipper chugged off in the little boat back to Lopar (presumably), we were left alone on the island, just the two of us. There was no other soul around. For a brief moment that felt a little scary (we also had to trust our skipper would return to collect us – but since he hadn't been given any money yet, we were quite confident he would). To our surprise there was perfect mobile phone reception on this abandoned piece of land, so that made it somewhat less worrisome to be here all alone. And the benefits of having the whole island to ourselves quickly outweighed any concerns. That said, though, there were plenty of places where we had to tread very carefully, as many buildings have by now so deteriorated that they are at risk of collapse – or already have half collapsed. You have to watch your step to avoid pitfalls, and also be careful what you stand underneath of. From the harbour we first headed to the gatehouse, beyond which the “industrial zone” of Goli Otik begins. 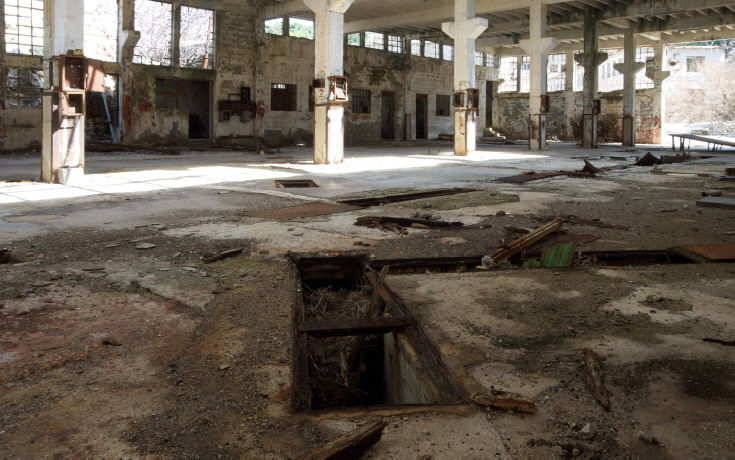 This is a complex of former workshops that the prisoners had to work in. There are some rather large two-storey halls to the left just behind the gatehouse, while the main street ahead that goes up the slope is lined with rows of smaller workshops. In some of them pieces of equipment and installations can still be found, but there is plenty of evidence of vandalism and looting too. All the fuse boxes have been opened and raided for their fuses, for instance, and you can see where cables have been pulled out. Practically all windows are broken, and many doors too. Of the inscriptions on the buildings that I had read about I wasn't able to find any. Once the front of one of the workshops bore the slogan “Mi gradimo Goli otok, Goli otok gradi nas – Zivio Tito” ('we build Goli Otok, Goli Otok builds us – Long live Tito'). 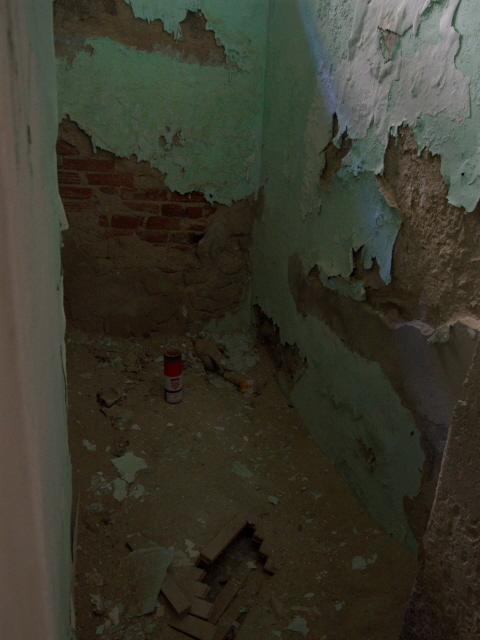 When I got there I found the area had been completely scraped off, down to the raw bricks. I presume the work of an ardent anti-Titoist. Not all damage is down to human activity, though, natural decay is equally in evidence. The pipe bridge that, as you can still see in older photos, once took a metal pipe across the main street, has meanwhile collapsed – in a very aesthetic way, I found. And it won't take long for the remaining support pillar, already precariously twisted, to rust through and collapse as well. As you climb higher you get a view over the barren, non-built-up bulk of Goli Otok and can also see beyond, e.g. to the neighbouring island of Grgur (see combinations). The vegetation is very sparse up here – and occasionally quite bent. I presume that comes from the strong winter winds (a regular weather phenomenon called “Bora” here). We proceeded past the large cistern on the right, which was used to collect rainwater to supply the prison colony, as there is otherwise no natural water source here. Where the road forks we took the left branch. This is the inland part of the island called Domalo. At its northern end is the complex of buildings that used to be the Admissions and Quarantine section as well as the infirmary. Getting inside is made somewhat more complicated here by all the sheep droppings in the entrance areas, but it's worth exploring. 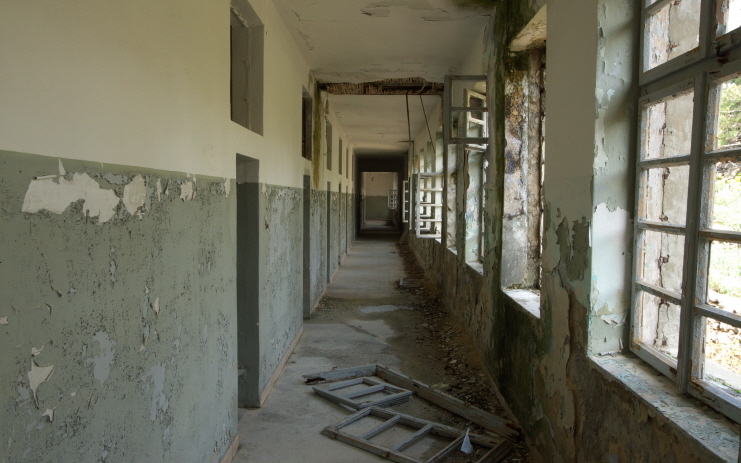 In fact, for me the infirmary was a highlight of Goli Otok. 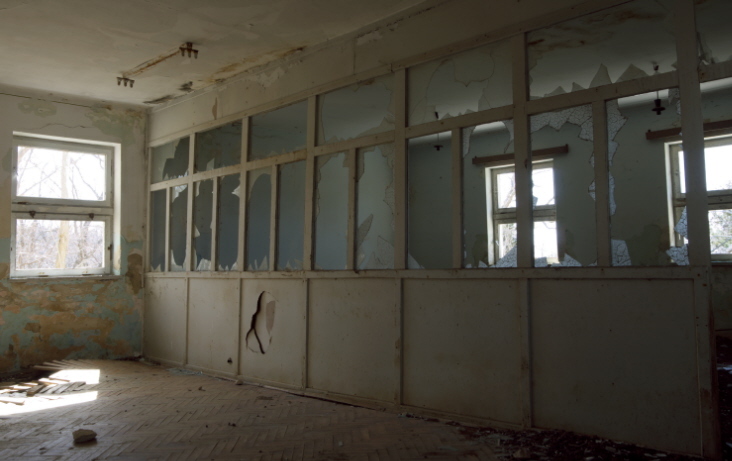 In one room there was still some equipment in situ, apparently an X-ray machine, going by goli-otok(dot)com. Photos on that site from the early 2000s show the control panel machine still in typical hospital-white enamel. By now it's rusted into a deep reddish-brown … Some of the electronic components from the inside have been looted, but it's quite remarkable that the machine as such is still there. There's an information panel on the outside wall of the building explaining its function within the prison system – so there is in fact some commodification! The panel's text is even in five languages: Croatian, German, Italian, Hungarian and English. More such panels can be found on a number of other significant buildings/locations, perhaps a dozen in total. Some are in better condition than others, which have suffered from the bleaching sun to the point that the photos are colourless and the text difficult to decipher. They could do with some maintenance. The translations into the languages that I understand are not perfect but perfectly sufficient. One bit of content on the infirmary's plaque is questionable, though: it is claimed that the hollow outside the building (looking a bit like an empty former swimming pool) was the infamous so-called “Peter's Hole” where prisoners were tortured. This is contested on goli-otok(dot)com, which states that the real thing was elsewhere and has been filled in. It does not specify what this hollow was instead, though (maybe it really was a pool?). 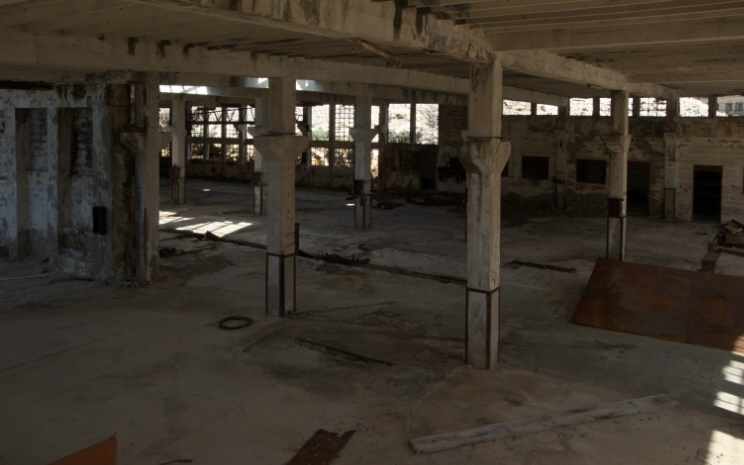 You can also explore the other buildings of this cluster as well but the rooms in these are mostly just empty. The same is true for the buildings further east, including what used to be the school (you have to wonder what subjects the prisoners were taught here, just practical skills pertinent to their work or political subjects, i.e. indoctrination, too?). In this part the path was blocked in several places by fallen trees, so a lot of clambering over dead wood and through the surrounding undergrowth was required. I presume that those fallen trees will be cleared away for the beginning of the holiday season, though. There are two courtyards where the prisoners of this block had the chance to get some fresh air. Upstairs are long corridors and the larger cells, some still with bars on the windows, some without (but you can make out the stumps where they have been cut out). In addition there are toilets and washrooms with some installations still in place. Some of the doors are unhinged and lie on the floor. Otherwise the rooms are empty, save for debris and dirt. Back outside, the main road heads south beneath the second cistern and water collector and leads to a crossroads. The right fork leads up the hill, the left one down to towards Vela Draga, the larger of two bays on the south-eastern coast of the island. The latter is also where the largest complex of buildings is located, in a deep valley and hence mostly secluded and invisible from Rab or the mainland. This area was referred to as “Žica” ('Wire'), because it used to be surrounded by a wire fence. The original accommodation barracks for the prisoners were demolished in the 1980s but the rest is still standing – at least partially, in some cases. As you come down the road, the big stone building on your right is quite a grand affair, with balconies, big windows and a porch with grand stairs leading to a spacious atrium. Obviously this building was not for the prisoners but will have housed the Headquarters of the prison command. 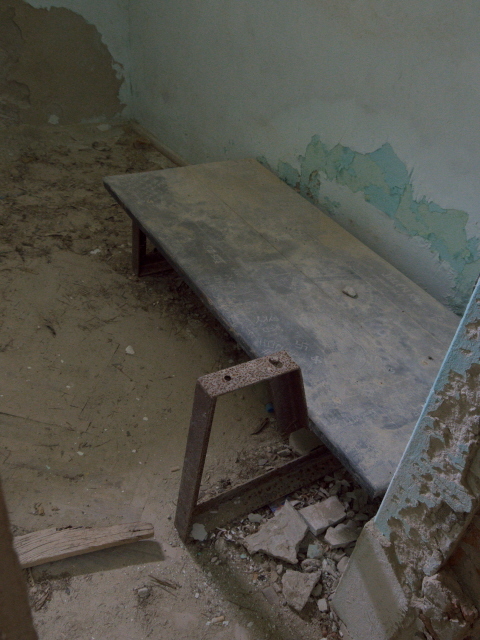 The interior is now almost completely bare, except for the odd piece of battered furniture. In the courtyard outside is a heap of rusting bed frames that may have come from the HQ building (likely not from the prisoners' cells!) and to the left is a large oblong building with barred windows on the top floor, where accommodation for inmates was provided from the 1970s onwards. The ground floor, however, houses the former canteen and kitchen. Some of the kitchen installations are still there. Upstairs are long corridors leading to the accommodation rooms on the one side, and rows of hooks along the wall opposite the doors. At the beginning of one corridor someone put up a wooden sign on which it says in English: “Spiritual Retreats! Silence!” And at the end of the corridor is a graffito saying “sob”, though I have my doubts that this is intended to be the English verb 'to sob'. 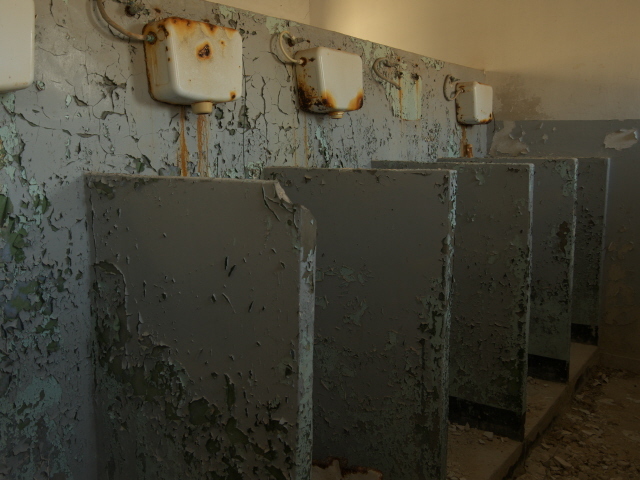 In addition there were washrooms with long rows of basins still mounted to the wall. Proceeding up the valley to the east you pass some sports area – a basketball court and some table tennis tables, and eventually you come to the large building at the far end, allegedly an administrative block too. Inside is a grand staircase and several big washrooms, some atmospherically dilapidated doors and windows, but not much else. Behind this building would have been the prisoners' barracks, of which only some bare foundations are left, and if you walked eastwards from those you'd eventually come to the cove where the women's prison used to be for a while, but which was closed long before the male prison was. Of the women's prison nothing but a few bits of rubble remain. And since I had read that before I went to Goli Otok I gave those parts a miss, considering the time pressure I was under. Nor did I make my way to Mala Draga (the small bay) where a pig farm used to produce meat – not for Goli Otok, but for the tourist island of Rab to the west. Also in this location is what's left of a pumping station. Back down by the main courtyard of the “Wire”, the buildings south of it deserve some attention, in particular the bakery, where some machines and a large baking oven still survive. Behind the bakery is a boiler house, now roofless, but the big boiler is still there. 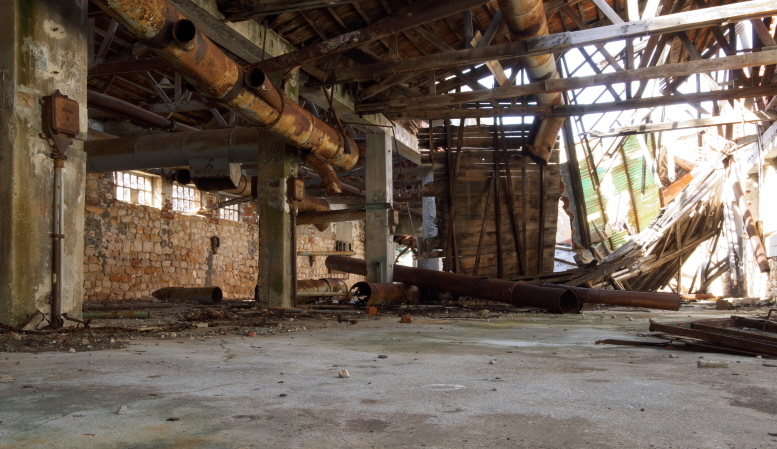 More heavy metal remnants can also be found in the equally roofless building at the front of the little quayside of Vela Draga. Walking back to the crossroads past what apparently used to be the arrivals and registration bungalow, there's also the building that I suppose used to house the theatre/cinema, but I couldn't find a way in to check if any of the seats or the film projector (that I had seen photos from the 2000s of) were still there. From the crossroads the road heading west climbs the hill, past a totally gutted building that I presume must have been an electricity transformer/distribution station or so. From up here you get excellent views over the entire “Wire” complex, the valley beyond and the blue waters of Vela Draga. The road continues through some barren rocky area before bending northwards heading for the forested part, i.e. the main area where prisoners had planted trees (see above). On the left you pass some storage buildings and an ex-diesel tank for the powers station on the shore below at the bottom of the cliff (but I couldn't figure out any access to that power station). 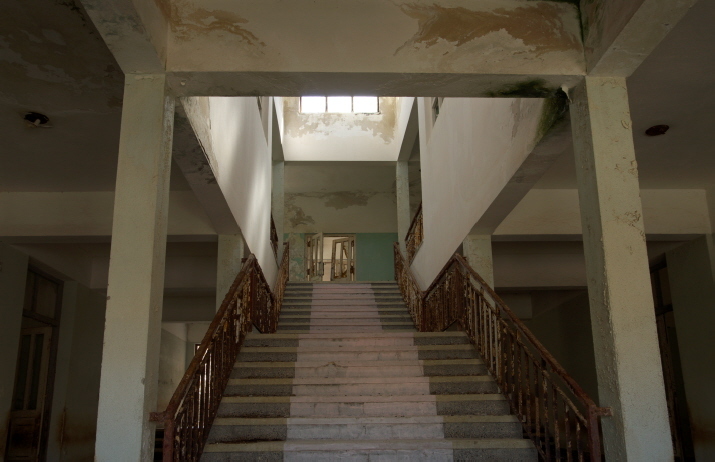 Then the path reaches the grandest of all the buildings on the island: the former main administration and commandants' HQ. It has arched colonnades attached to the front façade by the main entrance – and I guess that's why the prisoners allegedly referred to this palatial building as “the Hotel”. An actual hotel and restaurant complex was also built on the island, or at least it was tried to use one of the newest building on the island as such a tourist place after the prison had closed, i.e. still in Yugoslav times. But that failed as a business due to the break-up of Yugoslavia and the Balkan wars – all that according to goli-otik(dot)com, which also has a few postcards from those times (that never went into circulation). One has a picture of the tourist restaurant complex by the waterfront as it looked when it was intact. What you see now is a stark contrast. The low buildings' sloping roofs are almost completely gone except for the beams, and it looked not entirely safe to enter, so I gave them a miss. The area between this and the harbour is scattered with remnants of prefab buildings that have all more or less completely collapsed. These were clearly added in the latter years of the prison camp's existence. The early stone-built houses have stood the test of time much better. To the north of the harbour, there are yet more buildings of varying significance. Actually signposted is the “Kino” ('cinema'). But when I followed the signs I found it locked. I gathered from goli-otok(dot)com that the stone building must have been the former officers' mess. Apparently this is now used as a cinema for screening films, but only during the holiday high season, I presume. More accessible was another fairly grand stone building near the “Kino” right on the shore. 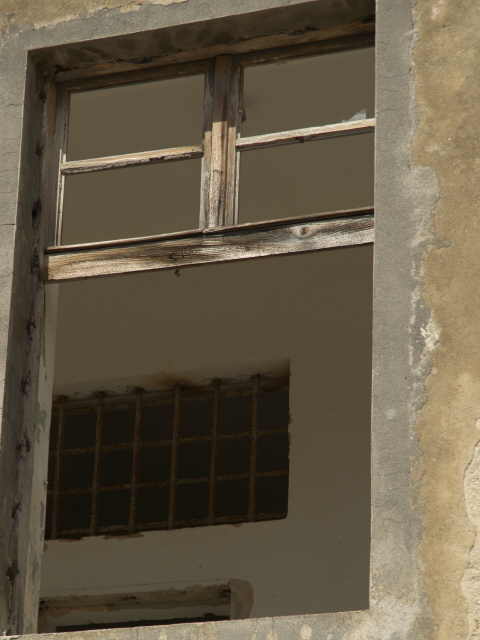 This was the original administrative HQ in the early years of the political prison, but in later years when Goli Otok was primarily for “regular” convicts this was the place where prisoners who had behaved well enough were allowed visits by family members. Further north, past an open area that looked like it may once have been a kind of park, the path leads to the second harbour of Goli Otok. This Harbour II with its two piers was actually larger than the first one, but is no longer in use. To the east of Harbour II are yet more workshops, and further north still the ruins of what used to be a marble workshop. Here prisoners made floor tiles, for instance. Inland from this complex is the most prominent of the island's many quarries, with one watchtower still surviving. And at the north-western tip of the island a small ex-lighthouse could be made out. Apparently there are also several bunkers in that part, as well as some shooting ranges. However, by this point I had run out of time and was thus not able to inspect these parts properly, but instead had to head back to the main harbour for my pick-up by the skipper I'd hired. En route I passed what looked like garages and car repair workshops, and then I got back to the industrial zone. As I walked from the north back to these parts, an unexpected sound was becoming audible in the distance, gradually getting more intense: loud pumping disco music. What a surreal contrast to the eerie quietness of the island and its ghost-town structures. Soon enough I was able to identify the source of the loud music: a rather large tourist boat was coming from the direction of Grgur in the north. At first I thought it was a party boat, and there were lots of people on board dancing to the music; but it soon became clear that the boat was in fact heading for Goli Otok's harbour. And indeed: the sound of the music became stationary soon enough, when the boat had moored. We had just headed back down the main street towards the harbour and were having a look around the gatehouse when we saw a large group of people (five or six dozen or so) emerging from the harbour and making their way up the road towards us. At least the volume of the music coming from the boat was lowered once its human cargo had been deposited on the island. We waited a bit for the masses to pass by – they were mostly teenagers, accompanied by a few adults. Neither were taking much interest in their surroundings, and probably even less so in the place's history. Incessant selfie-taking was evidently much higher on their priority list. As we walked down the stairs of the gatehouse one of the adults popped their head inside, only to immediately withdraw, saying something to the crowd that I presume must have translated as “there's nothing to see here”. Why they had come to Goli Otok, I have no idea. But for us it was time to go to the harbour and meet our skipper for the crossing back to Lopar in our little fishing boat. At least our timing had been good – we'd had the entire island to ourselves until these loud hordes arrived to disturb its unique atmosphere. Now it was time to go. So we re-boarded our little barge and headed back to Lopar (where we finally paid our ferryman). All in all I must say that Goli Otok was quite probably the top highlight of my two-week trip to Croatia in March/April 2018, even though that featured many other highlights too. A bit more time would have been ideal, in hindsight, but nevertheless, even if it was a bit rushed towards the end, having the island and its ghost-town ruins all to ourselves, in almost total silence (the odd sheep bleating or bird call aside), was exciting, and all the while there was this distant sense of a grim history in the air. So, done the right way, I would say that Goli Otok probably has to rank as the No.1 dark-tourism attraction in the whole country. Location: in the northern part of the island-studded Adriatic coastline of Croatia, only two miles (3.5 km) west from the nearest mainland and 2.5 miles (4 km) east from the north-eastern tip of the neighbouring island Rab. Access and costs: By boat only, either by hiring one privately, or in the holiday season using the regular tourist boat tours. The former is obviously more expensive than the latter. Details: When I went I privately hired a boat with skipper to take me to Goli Otok. This was the way recommended to me by my guide for Zagreb/Željava/Villa Izvor. Since it was off-season, making fixed arrangements in advance was tricky. So I simply asked the owner of the pension I was staying at in Lopar, Rab. He made a phone call, and soon after transmitted the offer from a guy with a boat who he knew who'd take me and my wife there two days later (it was Easter, hence the delay). The price he asked was 300 HRK (ca. 40-50 EUR). Off season any rare chance to make a little money on the side is probably welcome here. I thought it was quite a bargain offer. OK, the boat was small and very basic and quite slow, but it had a sun canopy and the sea was reasonably calm, so it was adequate. What hadn't been agreed on before setting off was how long we would have on the island. Given that most visitors stay less than two hours, and because of the reasonable price, I didn't want to push my luck too much and so I suggested three hours, which was accepted. In hindsight I wish I had said four, but never mind. Of course, you could also make your own way to the island, provided you're licensed to and capable of handling a boat. Then hiring a boat without a skipper would give you the fullest flexibility time-wise. Mooring at the harbour of Goli Otok is free of charge. How much the boat hire would cost, though, I can't say. In any case, if you go independently and off season, remember to take sufficient drinking water with you (and possibly a snack if you think you'll need sustenance) as there is nowhere on the island to obtain this (only in the holiday season when the restaurant and souvenir stall by the harbour are open). The most popular, but indeed very touristy alternative is to go in season and make use of the “Goli Express” tourist service (which is not running off season at all!). This includes a crossing in a modern, larger, faster and more comfortable boat for 70 HRK return. The boat runs twice daily and spends between 1.5 and 2 hours at Goli Otok. The “tourist train” (carriages dragged by tractor) that in season does a quick loop around some of the main points on the island in 20-30 minutes cost an extra 30 HRK. 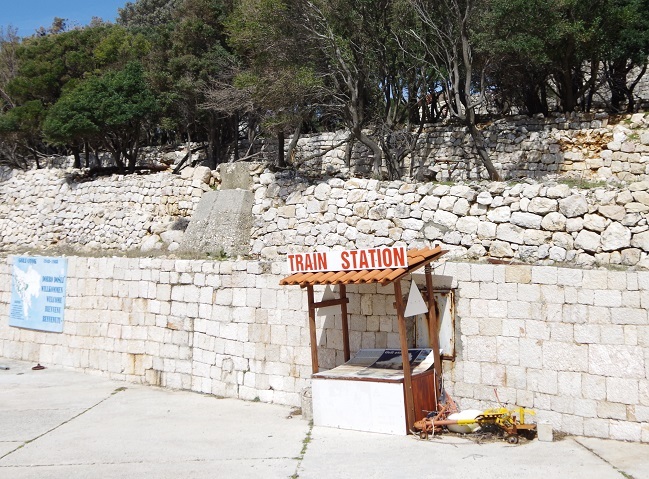 Other seasonal boat services also include stops at Goli Otok, some in conjunction with another stop at Grgur (see below) and some also operate out of the island of Krk. I have also heard of proper organized group tours, even with former political prisoners as guides, although these will become increasingly fewer as they age. There'll probably not be many left who were imprisoned on Goli Otok in its pre-1956 phase. I've read a Swiss newspaper article about such a tour and I've seen a video of another tour online (in Croatian with German subtitles). But I haven't been able to find any information (in English or German) on the practicalities of organizing that sort of tour. Time required: You could in theory probably spend a whole day here. Thoroughly exploring everything may even require more than that. I only had three hours (the time window agreed with the skipper I hired to get there), and managed to see the majority of sites of particular interest, but had to skip the north-western end of the island, the quarries and the more remote parts. At least it was much better than the high-season “Goli Express” visits that last only 90 minutes to two hours in total, including the option of using the little tourist “train” rides (said to last under half an hour). The crossing, in a simple fishing boat, took about half an hour each way (the modern tourist boats with their more powerful engines make it in less than ten minutes). 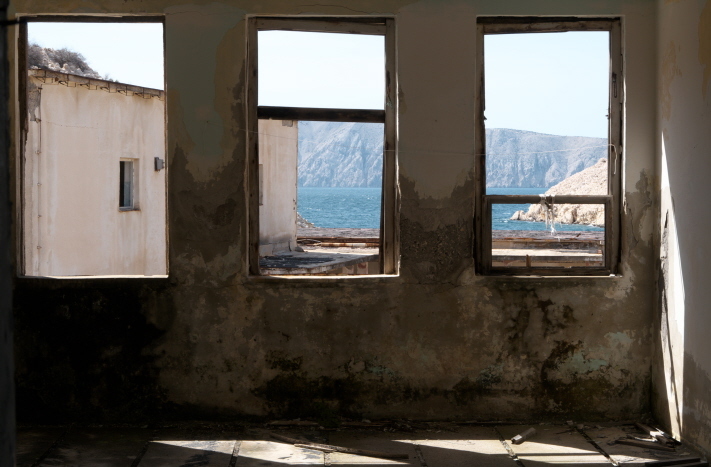 Combinations with other dark destinations: The neighbouring island to the north-west of Goli Otok, Grgur, also used to house a prison colony, namely for women, but that was already closed in 1970 and hardly anything of the original structures still remains, just a few shells of houses and some foundations. Some of the regular tourist boat tours from Goli Otok include a stop at that island too, where there is a seasonally operating tourist restaurant as well … and apparently fallow deer who live on this much more vegetated island come down to get hand-fed by tourists. The holiday island of Rab also has a couple of dark sights, especially a memorial to the Italian concentration camp that was in operation here here during WWII. In general see under Croatia. Combinations with non-dark destinations: See under Rab and Croatia in general.